What is a Pandemic and What Can You Do? Study Reveals Simple Answer. What is a Pandemic? And What can you do to protect yourself? What's the Fuss Over What is a Pandemic? June 11, 2009 the World Health Organization (WHO) declared the H1N1 swine flu epidemic to be a pandemic. What is the difference between an epidemic and pandemic? Here you will find the pandemic definition from both the dictionary and from the World Health Organization. Most importantly, you will find links to scientific studies that demonstrated that a simple supplement can protect you as it did the over 65 test subjects in a double blind placebo test. It is also interesting to look at the history of this incident. This will help us understand future actions as new pandemics are announced. An epidemic is defined as a disease that quickly and severely infects a considerable number of people. When the epidemic becomes wide spread, it is referred to as a pandemic. By this definition, AIDS in Africa is a pandemic rather than epidemic. A disease that is prevalent over an entire country or the whole world. Here were some links to sites with information on the pandemic. They may or may not be available. If not, check the WayBack Machine. July 2009 at the start of the pandemic, the top 10 searches for swine flu information were as follows. This may be an indication of interest in the topic and how to best prepare for it by those searching. Wikipedia seems to be continually updated on the subject. WHO- The WHO Definition of What is a Pandemic? The WHO has a unique way of defining a pandemic. The definition or designation of pandemic is based on criteria that more accurately defines if an outbreak is an epidemic or pandemic. Further, the phases identify time frames that mediation efforts need to be performed. In 2009 the WHO began using a six phased approach to better incorporate new recommendation and approaches into existing national preparedness and response plans. They are grouped to make them easier to understand. Each phase is based on actual observations. This will also make process more precise. Phases 1-3 involve the preparedness, capacity development and response planning activities. This is happening although the general public may not be hearing about it. The first waves facilitate post pandemic recovery activities. Phases 4-6 signal the need for response and action to reduce the severity, seriousness and or painfulness of the pandemic. As of June 11, 2009, the H1N1 Swine Flu epidemic has been upgraded to a pandemic. Phase 1 No report of viruses circulating among animals have been reported to cause infections to humans. There are no viruses circulating among animals that have been reported to have caused infections to humans. Phase 2 An animal influenza virus known to have caused infection in humans. It is considered a pandemic threat. Note: Influenza viruses occur continuously in animals and especially birds. Phase 3 Animal or human-animal viruses have caused irregular outbreaks of disease or disease outbreaks in small groups of people, but there is no human to human transferal of disease in sufficient numbers to have a community wide outbreak Limited transmission may occur among those who have a relationship with others. The key is that it has not spread to the community at large nor is it at self-sustaining levels.. It is just a case of "the flu is going around." 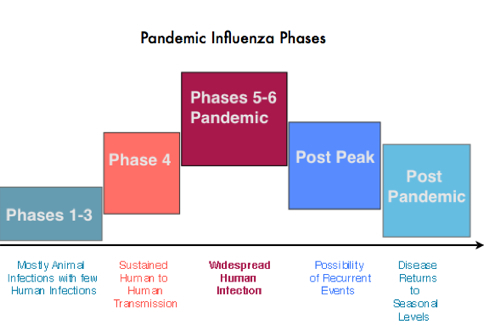 Phase 4 Verified human-to-human transmission of an animal or human-animal influenza virus that has the potential to cause community-level outbreaks. The pandemic risk is based on the potential for a sustained disease outbreak in a community. This phase indicates a significant increase in risk of a pandemic but does not necessarily mean that a pandemic exists at this time. The WHO is available for consultation to any country that suspects or has a verified outbreaks. They will help in the decision process and implementation of rapid pandemic containment operations. Phase 5 Human-to-human spread of the virus to at least two countries within one WHO region. The declaration of phase 5 is the effectual announcement that a pandemic is imminent. It is also serves as the announcement that there is only a short time to complete the organization, communication and implementation of the plan of action to deal with the pandemic. Phase 6 On announcement of Phase 6, there is an actual pandemic. It means there are community level outbreaks in at least one other country in a different WHO region. This is in addition human to human spread to the two countries within one WHO region of Phase 5. On the announcement of this phase, a global pandemic is considered to be happening. Phase 6 will be followed by a post peak period. There may be a drop in the number of those infected with the disease. It may seem as if the pandemic is ending. However, additional waves can appear and it is necessary to continue vigilant. Pandemics in the past have a recurrence wave. On the dropping of the numbers, some will naturally think it is over. There needs to be vigilance for the possibility of another wave. History has shown that there can be months between the waves. Once the post pandemic phase is reached, the disease will return to the seasonally normal levels. Surveillance will continue and strategic planning will be assessed and updated as needed. The Swine Flu Studies A simple preventative treatment. Can it be so simple? You will want to read the studies and decide for yourself.